Oasis Petroleum added acreage in the third quarter is nearing half a million acres prospective for the Bakken and Three Forks. In September, the company announced several deals that added over 160,000 acres to the company's position. At year-end, watch for additional announcements related to results from downspacing tests and wells in the lower portion of the Three Forks. 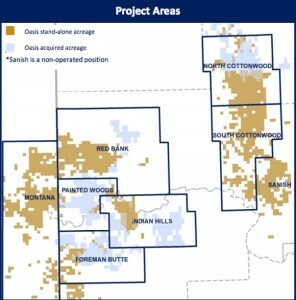 The company currently expects to drill 4-6 wells in the Middle Bakken and 1st bench of the Three Forks in the best areas of the the basin. Drilling in 2014 will be split relatively evenly between the Bakken and Three Forks. If wells in the lower portion of the Three Forks prove successful, the mix of drilling could be weighted toward the Three Forks more than currently planned.